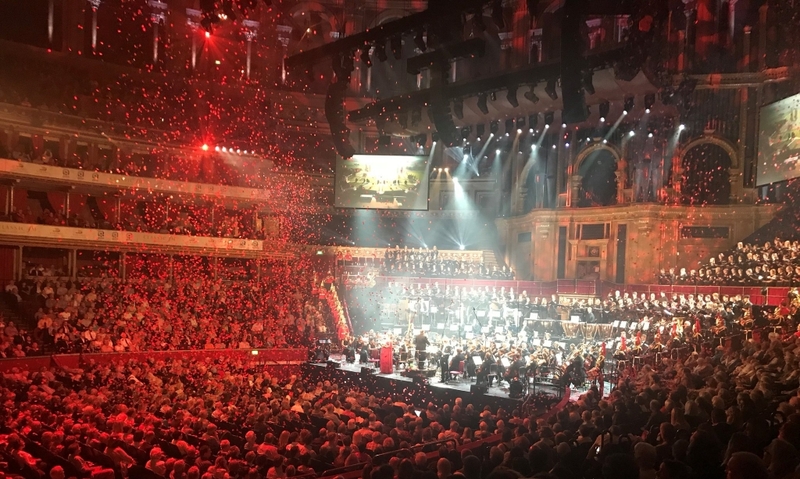 With nearly 300 performers on stage including Military Bands, archive film footage, and poppies cascading from the ceiling of the Royal Albert Hall, the World Premiere performance of The Great War Symphony was truly a night to remember. I was honoured to be asked to conduct the whole concert, with some of Britain’s great classical pieces connected with war and conflict in the first half as well as the Symphony in the second half. And I was thrilled to be working with fantastic musicians: the Royal Philharmonic Orchestra, National Youth Choir of Great Britain, London Youth Choir, Berkshire Youth Choir, Invictus Games Choir, soloists Louise Alder and Joshua Ellicott as well as the superb Military Bands – The Band of the Household Cavalry, Fanfare Team of the RAF and The Corps of Drums of the Royal Marines. The first half opened with the fanfare to welcome HRH Prince Michael of Kent played by the Fanfare Trumpeters of the RAF, moving gracefully in to Britten’s exquisite arrangement of The National Anthem – it starts so quietly and gradually builds to a rousing finish – spine tingling! Classic FM presenters Marghaerita Taylor and John Suchet then introduced the next couple of pieces – Parry’s I Was Glad and John Williams’ Hymn to the Fallen from Saving Private Ryan. We were then able to showcase each of the various performers – the strings of the Royal Philharmonic Orchestra for Barber’s Adagio, the whole orchestra for Holst’s rousing Mars from The Planets and the choir singing the unaccompanied choral arrangement of Elgar’s Nimrod with the words of the Lux Aeterna. The climax of the first half was the fantastic Songs of the Brave – a new arrangement of World War One music by Major Craig Hallatt from the Band of the Household Cavalry which, quite rightly brought the whole of the Royal Albert Hall to it’s feet in a standing ovation. Then came the second half, and the World Premiere performance of The Great War Symphony. What can I say?! The various performance elements came together beautifully to create a unique event that will be remembered by the performers and audience alike for years to come. The imagery on the screens above the stage featuring archive footage from the Imperial War Museum really helped tell the story of the war and the Symphony. And, to represent remembrance from across the British Isles, we had our additional choirs beamed in: the National Youth Choir of Scotland in the second movement, the Cross Border Youth Choir from Ireland & N.I. in the 3rd, and the Kana Choir representing Wales in the fourth. They blended seamlessly to join the choirs on stage. Again the fantastic audience were on their feet to provide the second standing ovation of the evening. Everyone involved in the project gave their all and I will be eternally grateful to them for going that extra mile and for the support they gave me. Thank you, thank you, thank you! For more behind-the-scenes photos from the night check out the Classic FM website! And the album is still at No.1 in the Specialist Classical Chart and with other performances still to go the adventure isn’t yet over!